It also allows us to offer the revolutionary Invisalign Invisible Braces System. Our patients who have used this treatment to move their teeth instead of traditional wires and brackets have appreciated its flexibility and non-distracting appearance. The itero system gives Dr. Moore’s patients access to this treatment option, and is supported by a vast team of dental professionals at Align Technology (www.aligntech.com) The experience and know-how Dr. Moore has developed includes a wealth of information about individual tooth movements and all types of malocclusions, and about what moves teeth predictably and quickly.. Through digitized impressions, Dr. Moore is able to gain insights into how best to move your teeth into their proper position in a timely, esthetic manner. No other dentist in the Peterborough area offers digitized scanning technology. 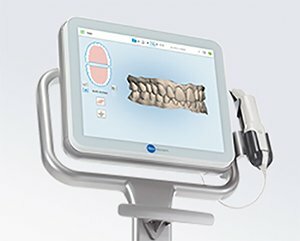 Dr. Moore’s reputation for being ahead of the technology curve is supported by our fast adoption of this technology into our practice. Our patients love it, our labs love it and our results are outstanding. Ask us for more information about this revolutionary technology and how it might help you.